Our son Andrew and his lovely girlfriend Danielle recently joined us for a home cooked dinner. Both Chris and I always enjoy spending time with our kids and these two in particular are a treat for Chris to cook for because they seem to love most of moms cooking and are willing to eat just about anything. If she’s missing them, a quick call or text to Andrew will usually get his taste buds going so it’s an easy way to get them to stop by and see us. Who doesn’t like a free dinner? Danielle compliments and said that she feels like she’s eating at a fancy restaurant when they join us. Though Chris is flattered, she really believes much like great wine, it all comes down to quality ingredients! This night, Chris’ prepared lime coconut shrimp on the barbecue with a roasted beet salad that contained Crave Brothers ciliegine (cherry sized) fresh mozzarella balls. This fresh mozzarella is a fresh, milky cheese great for salads and appetizers. She finds these great ingredients at the new Whole Foods in Maple Grove. The Crave Brothers Farmstead Classics are a family of award-winning artisan cheeses, produced by using 100% green power and practicing water conservation and recycling. 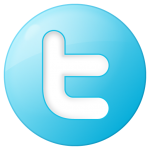 The cheeses are made at their state-of-the-art farmstead cheese factory, with milk from the Crave Brothers Dairy Farm. 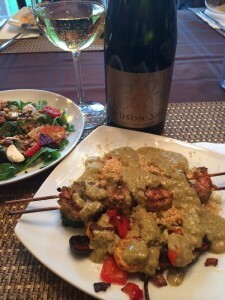 Good stuff that paired nicely with this Hudson Shah Chardonnay! The aromas were moderate, young-fruity and it had buttery of citrus and lemon. 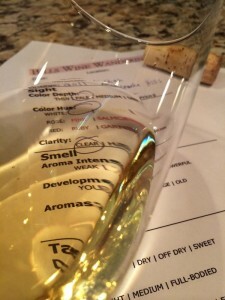 This Chardonnay was dry, medium-bodied, and the acidity was balanced. The tannins were soft and I noticed soft velvet mid-palate flavors with a long flavorful finish. Region/Appellation: Washington State, Rattlesnake Hills. 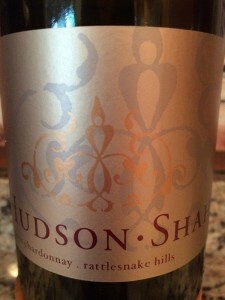 I rated the 2011 Hudson Shah Chardonnay three glasses. This Chardonnay paired great with our dinner.